You probably missed it on the news, three weeks ago, the item about the Vietnamese rhinoceros going extinct; it didn't make a lot of noise. The fact that an animal which had roamed the jungles of Vietnam for millions of years had now disappeared from the Earth for ever didn't hit the front pages, or the television headlines: there were far more pressing concerns for the world. A rhino in Vietnam? So what? Who's bothered? But I've been thinking about it ever since. I find the story gripping. Nobody knew there were any rhinos at all in Vietnam, or in mainland Indo-China, for that matter, until just over 20 years ago, when hunters shot one in the dense forests of the Cat Tien National Park about a hundred miles north of Ho Chi Minh City (Saigon as was). Imagine. You suddenly realise your country's got rhinos. You had no idea. It's like finding wolves surviving in the Scottish Highlands. 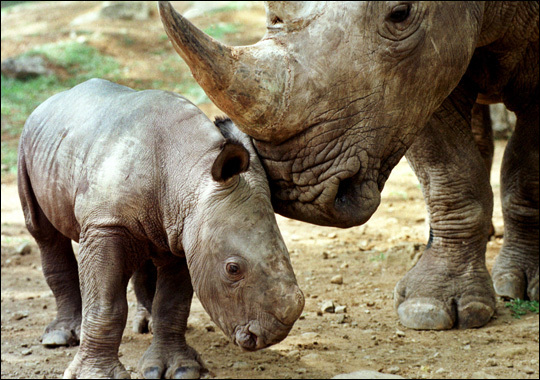 It turned out to be a subspecies of the Javan rhinoceros, itself one of the world's rarest animals, and its discovery was one of the first elements of what you might call Vietnam's zoological peace dividend. For nearly 40 years, remember, the country was continually at war, with the Vietnamese fighting first the Japanese, then the French, then the Americans, and its tropical forests were off-limits to all but the combatants; but after hostilities finished, in 1975, the jungles slowly began to give up their secrets, which included a whole series of large mammals previously unknown to science. The Vietnamese rhino was the first of these; and for more than a decade, it was known only from the skin the hunters had kept, and then from footprints and droppings. But in 1999, it was at last photographed in a camera trap, by an automatic pre-positioned camera which captured an unforgettable image, an image to make you shiver with excitement, of a monstrous beast crashing through the jungle in the dead of night. Zoologists worked out that the population of the Cat Tien rhinos was very small, probably below 10; and it was assumed – I certainly assumed it – that no effort would be spared in safeguarding this wildlife treasure, South-east Asia's rarest animal. But here we are, a decade on, and the Vietnamese rhinos have gone. All of them. Poachers had the lot, for the booming market in rhino horn as a component of traditional Asian medicine. Genetic analysis of dung samples has now shown that an animal shot in the park for its horn in April last year was the last. Millions of years, it had lasted, Rhinoceros sondaicus annamiticus; and then humans find it, and it's gone in 20. It wasn't easy to save, and was on the brink of extinction anyway, but the fact remains that we've snuffed it out. We are the species that destroys. Is that not how humanity should be defined? Never mind the possession of consciousness, and language, and art, we are special in a different way: we are the only species capable of destroying our own habitat. Yet the more damage we do, the more plants and birds and mammals we wipe out, the more forests we cut down and the more seas we pollute, the more we seem to retreat into a secular, smiley, people-centred creed, and which insists that humans are basically, fundamentally, good. Maybe they're not. Ever considered that? Ever looked at the baleful effect we have on the Earth, and considered that perhaps there is something deeply wrong with us as a species? Not to worry. That's not a thought that's allowed any more, now that we've thrown our gods away, and deified humanity instead. And anyway, it was only a rhino. In Vietnam, or somewhere. And who's bothered? It will be fascinating to see what fate awaits the remainder of Vietnam's zoological peace dividend, the dozen or so new mammals that have turned up in the past 20 years as researchers have probed the country's jungles. They are led by the saola, a sort of cross between an antelope and a buffalo with long, backward-sloping horns and a white-striped, mournful-looking face – it's a beautiful animal – which inhabits the moist mountain forests of the Annamite mountains. It was discovered in 1992 and not photographed until 1999. There are only a dozen or so recorded sightings, most of them of dead animals. There are none in zoos, but a reserve has been set up. At least three new species of deer have also been found, notably the giant muntjac, related to our own muntjac which is busy eating the undergrowth of the woods of southern England; and a major primate species, the Tonkin snub-nosed monkey, thought extinct, has been rediscovered, but is also very rare. Let's wish them luck; if they are to see out the 21st century, they will need a lot of it.